An original yeast-based phenomic model for DeltaF508 CFTR, by far the most prevalent allele of the CFTR gene responsible for cystic fibrosis, has been developed by the groups of Elizabeth A Miller and John L Hartman. This model allows potential modifier genes of the DeltaF508 CFTR allele to be uncovered. Hence, brewer's yeast Saccharomyces cerevisiae is not only needed at happy hour, it also represents an invaluable tool for human geneticists. For many Mendelian phenotypes, identification of the culprit gene and its alleles is often insufficient to understand the disease, as the penetrance of these alleles is largely dependent on the genetic background. Disease phenotype is therefore highly variable between individuals and identifying so-called modifier genes is an important step towards personalized medicine. Looking for modifier genes is one of the major challenges of modern human genetics, and there is a need for new simple comprehensive methods to identify these genes in an efficient and unbiased fashion. In this issue of Genome Medicine, the groups of Elizabeth Miller (Columbia University, NY, USA) and John Hartman (University of Alabama, AL, USA) describe a novel yeast-based model to search for modifier genes involved in cystic fibrosis . The authors introduce a mutation in yeast that is equivalent to the cystic fibrosis transmembrane conductance regulator (CFTR)-ΔF508 human mutation, that is, deletion of phenylalanine at amino acid 580 of the CFTR protein. Using this yeast model, the authors perform a comprehensive search for genes that, when inactivated, suppress or exacerbate the phenotype resulting from this mutation. The authors describe it as a 'phenomic model'. This high-throughput phenotyping approach is quantitative and based on the synthetic genetic array method . The authors concentrated their study on CFTR-ΔF508, by far the most prevalent allele of CFTR, whose mutations are responsible for cystic fibrosis. Indeed, CFTR-ΔF508 is over-represented among the more than 1,900 different mutated alleles of CFTR identified so far, as it accounts for more than 70% of them. This mutation impairs CFTR folding, leading to the defective trafficking of this protein to the plasma membrane of secretory epithelial cells, where it normally functions as a chloride channel . Instead of being properly addressed to the plasma membrane, the CFTR-ΔF508 protein is recognized and degraded by protein quality control systems, such as the ubiquitin-proteasome pathway. As a consequence, a deficit in chloride transport is observed that leads to dehydration and thickening of the secreted mucus, in particular in the airways. This in turn causes many lung infections and, ultimately, fatal respiratory failure. However, it has long been known that forced trafficking of CFTR-ΔF508 to the plasma membrane - for example, by growing cells at low temperature - at least partly restores its function, because the CFTR-ΔF508 mutation does not have a strong impact on the actual biological function of the CFTR protein. Hence, every modifier gene that suppresses or exacerbates the trafficking defect of CFTR-ΔF508 would respectively decrease or increase the impact of the mutation in patients. 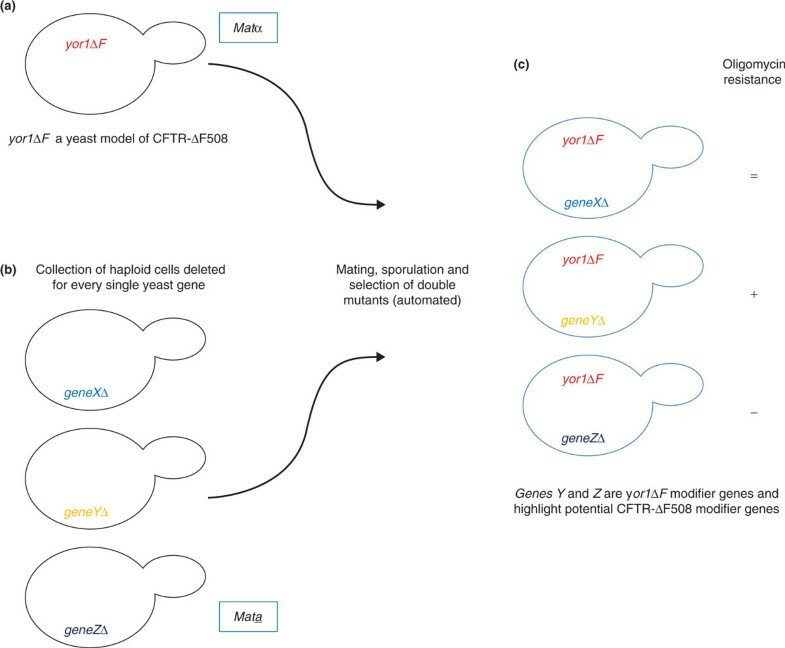 The rationale of the yeast-based model for CFTR-ΔF508 was thus to recapitulate its defective folding and trafficking by introducing an equivalent mutation into one of its yeast homologs, thereby allowing isolation of modifier genes thanks to the tremendous power of yeast genetics. Yeast has long been used as a powerful model system for basic research aimed at deciphering the most fundamental cellular mechanisms. Over the past one or two decades, yeast has also been used as a model and tool for biomedical research. This use extends from the field of diagnostics to drug discovery and production. For example, an elegant yet simple yeast-based assay has been developed for assessing the functionality of the tumor suppressor gene p53 , a crucial piece of information with respect to the choice of treatment for many cancers. Yeast is also used to produce therapeutic compounds such as hydrocortisone, a major steroid for the pharmaceutical industry . In addition, yeast is increasingly used for drug screening, in particular for human inherited disorders. In the simplest and most direct cases where a functional homolog of the affected protein in human exists in yeast, the identified mutations can be introduced at synonymous positions in the considered gene, as in neuropathy, ataxia and retinitis pigmentosa (NARP) syndrome, a devastating mitochondrial disease . More complex are the situations where no functional ortholog exists. In these cases, it is desirable to obtain a phenotype that is relevant or close to the pathologic mechanisms, such as for the prion-based diseases  or Huntington's disease . However, in all of these models, the basic idea is always the same: obtaining a yeast phenotype that is relevant for the considered disorders and then looking for modifiers of this phenotype. These modifiers can be positive or negative (that is, they may either suppress or exacerbate the phenotype) and they can be drugs or genes or any other biological or chemical moiety. In addition, forward chemical genetics approaches can be performed in yeast for the discovery of chemical probe targets . No ortholog of CFTR exists in yeast, so to produce the phenomic model of cystic fibrosis described above another ATP-binding cassette (ABC) transporter of the same family as CFTR was required. Therefore, the equivalent mutation (deletion of a phenylalanine) was introduced in the synonymous position (670) of the Yor1 protein, an ABC transporter that is the primary determinant of oligomycin resistance in yeast because it extrudes this toxic compound from the cell. The authors of this study then convincingly showed that the mutation had the same effect on the yeast protein as on human CFTR; that is, interfering with its proper trafficking to the plasma membrane and leading to its misfolding and reduced half-life. However, unlike CFTR-ΔF508, Yor1-ΔF670 does not retain membrane transport function, a problem that the authors circumvented by introducing a second mutation (R1116T) that restores partial pump function. Hence, Yor1-ΔF670-R1116T confers a partial oligomycin resistance that is intermediate between that of Yor1 null mutants and wild-type Yor1. Based on this so-called Yor1-ΔF strain and using a synthetic genetic array method , the authors then looked for modifier genes that, when inactivated, increase or decrease oligomycin resistance of the Yor1-ΔF strain. The rationale for this method is shown in Figure 1. Briefly, the Yor1-ΔF strain was mated to a deletion strain collection and double mutants were selected. Their respective growth rate in the presence of oligomycin was then assessed, thereby allowing comprehensive identification of synthetic interactions between Yor1-ΔF and all cellular pathways. Flowchart of the synthetic genetic array-based method for identifying CFTR-ΔF508 modifier genes. The (a) Matα yor1ΔF haploid strain, which presents an intermediate level of oligomycin sensitivity between that of Yor1 null mutants and wild-type Yor1, is robotically crossed with a collection of (b) Mata haploid strains that are deleted for every single yeast gene. Then sporulation of the resulting diploids is induced and the haploid double mutants are robotically selected and (c) their level of resistance to oligomycin assessed. An increased (yor1ΔF, geneYΔ double mutant) or decreased (yor1ΔF, geneZΔ double mutant) resistance to oligomycin indicates genetic interaction between yor1ΔF and the corresponding gene deletion, thereby highlighting yor1ΔF modifier genes. These yeast genes reveal potential human modifier genes of CFTR-ΔF508, which then require further validation in human cells expressing CFTR-ΔF508. Using this procedure, the authors highlighted cellular pathways and genes already known to modulate processing of CFTR-ΔF in mammalian cells, like the proteasome or E3 ligase Ubc7/Qr18, two actors affecting the turnover of CFTR-ΔF508. This result represents a first validation of the phenomic model. In addition, other evolutionarily conserved pathways were also identified, like the recently discovered endoplasmic reticulum membrane complex . The involvement of this pathway in trafficking misfolded ABC transporters was validated by a small interfering RNA approach in a human cell line expressing CFTR-ΔF508. Therefore, it seems that this elegant yeast-based method constitutes a valuable tool for investigating gene interaction networks that can modulate cystic fibrosis disease severity, and further enable the identification of so-called modifier genes. This seminal work by the teams of Elizabeth Miller and John Hartman constitutes a proof-of-concept that yeast-based phenomic approaches allow for the identification of modifier genes for human inherited disorders, provided that the main phenotypical consequences resulting from the causal mutations can be recapitulated in yeast. Therefore, whilst brewer's yeast offers the opportunity to share a couple of pints at happy hour, favoring social interactions between people, it also provides the perfect environment for flirting with human genes involved in inherited disorders. cystic fibrosis transmembrane conductance regulator. I thank Dr May C Morris for critical reading of the manuscript.